The giant Galapagos tortoise is considered a vulnerable species by the IUCN. Common name: Galapagos tortoise, giant Galapagos tortoise. The word tortoise is usually used for terrestrial turtles in the family Testudinidae. Galapagos tortoises are the only surviving lineage of giant turtles in the world that show two different types of shell shapes. There are two remaining families of giant tortoises in the world the Galapagos tortoise and the Aldabra Atoll tortoise of Seychelles in the Indian Ocean. This reptile is the largest living species of tortoise. They have a large brown bony carapace with large variation in size and shape in all subspecies. Saddle-shaped, flat carapace with long neck. Smaller in size. Males can be up to 3 times heavier than females. Dome carapace, shorter neck and limbs. Larger in size. Males and females are about the same size. Intermediate between the saddle and dome shape. Carapace grows by increasing in diameter of each bony plate but it is not useful in determining age as the outer edges wear over time. A tortoise can hide its head and limbs into its carapace for protection. Their legs are short and stumpy and are covered with hard scales. The Galapagos tortoise inhabits the Galapagos Archipelago Islands off the coast of Ecuador. Larger tortoises with domed shaped carapace and short necks inhabit islands where volcanic highlands are high in humidity. During the rainy season they migrate to lowlands. Smaller tortoises with saddle shape carapace and long necks live on lowland islands with low humidity. Males weigh from 600 to 700 lbs or 272 to 317 kg. Females weigh from 300 to 400 lbs or 136 to 181 kg. They can reach lengths up to 6 ft or 1.8 m.
They spend most of their waken time foraging. Galapagos tortoises sleep up to 16 hours a day. Tortoises move slowly at speeds as low as 0.2 mph or 0.3 km/h. Males display aggressive behavior. Usually the smaller saddleback dominates dome carapace tortoises. They can flip themselves if turned upside down on their backs. Not very good swimmers but can float on water. Their digestion is influenced by atmosphere temperature. The higher the temperature the faster the digestion. On larger and humid islands Galapagos tortoises migrate from highlands to lowlands during rainy season. Tortoises are ectotherm. They are cold blooded animals so they need to regulate their body temperature by basking in the sun or cooling down in water. They feed on cactus, grass, fruits and berries. They can survive without food or water for at least 6 months. Reproductive maturity is reached at age 20 to 25 when raised in captivity. In the wild it is possible that they reach maturity at around 40 years old. Males compete against each other for females. Breeding peaks between February and June during the rainy season. They mate at humid higher elevations and move to lower and drier areas for nesting. Females lay from 1 to 4 clutches per season during the dry season between July and November. Clutch size ranges from 8 to 17 depending on the subspecies. Approximately 78% of eggs hatch. Incubation takes from 3 to 8 months depending on the temperature. Eggs hatch late December to April. It is estimated that Galapagos tortoises live up to 150 years. Habitat restriction due to human settlements. Introduced feral dogs and cats into the islands. Hatchings and young tortoises can die due environmental conditions such as excessive heat and flooding. Late reproductive maturity and slow growth rate make Galapagos turtles vulnerable to extinction. The Galapagos tortoise is listed as vulnerable in the IUCN Red List of Threatened Species. Listed in Appendix I of CITES. They are protected by the Galapagos National Park Service. On his second voyage Charles Darwin observed differences in the tortoises carapace and their habitat contributing to the development of his theory of evolution. Five of the fifteen tortoise subspecies have become extinct because of human interference. Tortoise highways are referred to a path used for many generations by dome carapace tortoises to migrate between highlands to lowlands during the rainy season. 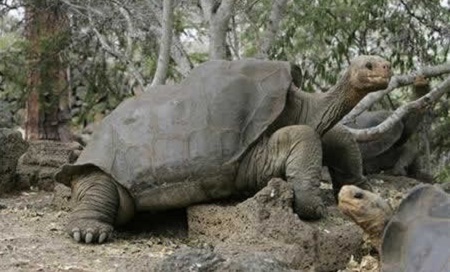 The longest living Galapagos turtle, Harriet, lived to 170 years old. She was kept in Australia Zoo and died in 2006. 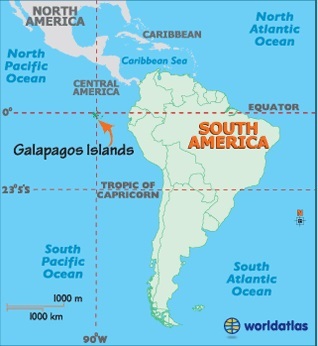 The Galapagos Islands were named after the giant tortoises. In old Spanish galapago meant saddle as in the shape of their carapace.